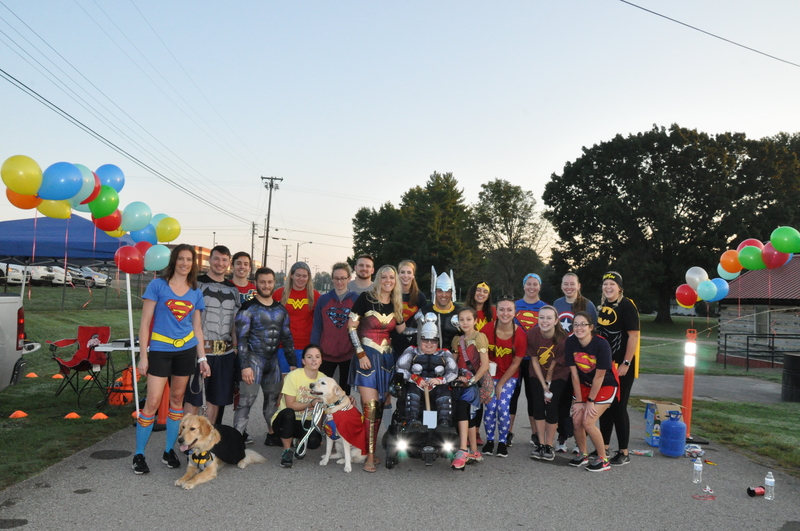 The Belmont University Doctor of Physical Therapy (DPT) students volunteered for Garrett’s Hero Run, a 5K event held each year to raise money and awareness to find a cure for Duchenne Muscular Dystrophy. Each year the students travel to Columbia, TN to participate in and volunteer at the run to support a member of the ‘Belmont PT Family’, a 2005 graduate of the program, Amber Sapp. Amber’s son, Garrett, has Duchenne Muscular Dystrophy, and Amber and her husband Randy hold the 5K event annually to raise money for Parent Project Muscular Dystrophy (PPMD), the largest non-profit organization devoted solely to ending Duchenne. The DPT students helped with setting up for the race, directing runners through the course and cheering them on along the way. They created signs to display throughout the race to educate the runners about Duchenne and dressed in their super hero outfits in support of the real hero of the day, Garrett. Special appearances were made by therapy dog, Layla and future therapy dog, Jaxson, featured as superman and batman.